Today, Israel is surrounded by threats. Iran is building out their military capabilities in neighboring Syria and has already attacked Israel directly. The Hezbollah terror group has stockpiled thousands of missiles for a future war with Israel, while Hamas in Gaza has been in an off-and-on conflict with Israel for more than a decade. The Americans recognized that the Jewish State faces more than just Iran, which along with Syria has sought nuclear weapons in the past. 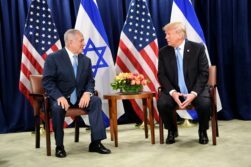 “Israel is also threatened by the reckless proliferation of destabilizing weapons systems into the region that increase the possibility of an escalated conflict in an already dangerous and volatile theater,” said the statement from Nauert. The deal provides Israel with $3.3 billion in annual Foreign Military Financing and $500 million per year for missile defense cooperative programs. Israel and the US have long been jointly developing advanced missile defense programs, and American aid has helped Israel launch the Iron Dome system.